The wildly successful Santee Street Fair returns this Saturday, May 26, from 10:00 a.m. to 7:00 p.m. along Riverview Drive east of Santee Trolley Square. The family-friendly event is free and features hundreds of vendors, live bands, rides and games for the kids and plenty of food. 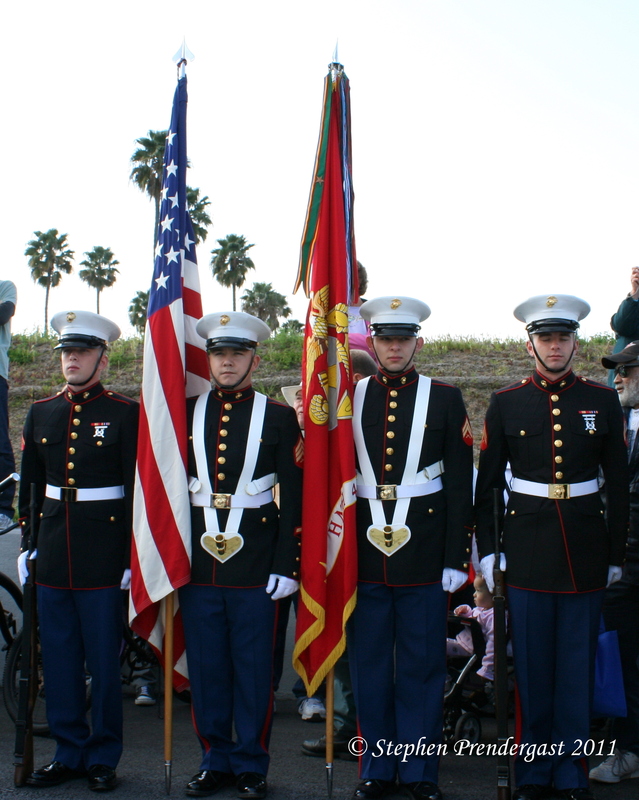 This year, to help kick off the Memorial Day Weekend, the Santee Street Fair will honor our military heroes with a special ceremony. The Santee Street Fair is the largest single-day festival in the East County, with over 40,000 people attending last year and even more expected this time. It is put on by the Santee Chamber of Commerce and the City of Santee as a way to promote the community throughout the greater San Diego region. Businesses from throughout Santee and around the county will be there to share information with visitors. 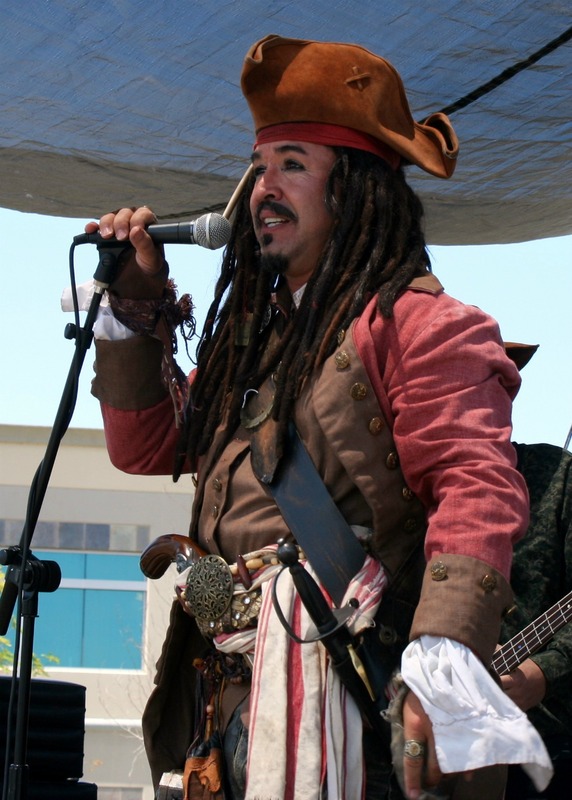 Santee’s own Clint August, from 101KGB, will act as master of ceremonies for the day, but there are rumors that a certain local pirate could drop in to commandeer the microphone at some point. Along with the Santee Chamber of Commerce and the City of Santee, the Street Fair is supported by Padre Dam’s Santee Lakes, Barona Resort & Casino, AIR Santee, SDG&E, Union Bank, El Cajon Harley Davidson and many other companies and organizations. 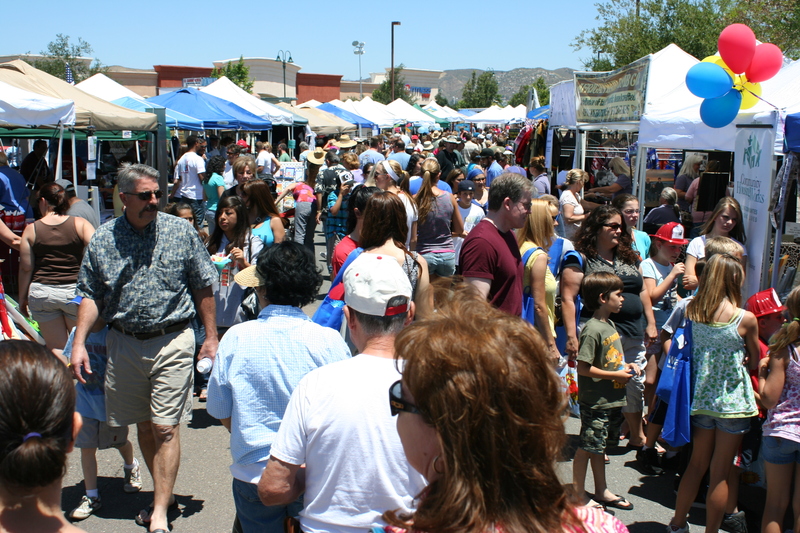 The first Street Fair, in 2009, came together in only six months and showed what Santee could do when people who cared about the city put their minds together. Since then it has grown to a greatly-anticipated celebration that draws rave reviews every year. The 2012 edition will feature many of the same vendors and entertainment that people have enjoyed, with many new ones to discover. While the Street Fair is free, as is parking, be sure to bring plenty of money to enjoy all of the different foods that will be on hand. In the past the fare has ranged from Hawaiian shaved ice to hot dogs and hamburgers and top-notch barbecue. This year the beer garden will feature Santee’s own Manzanitza Brewing Company, which will soon celebrate their second anniversary with a move to a new, larger facility. The second annual Santee Car Show attracted thousands of visitors to the community on Saturday, October 8. The event featured classic cars, great music by Moondawgs and 4 Lads from Liverpool, and a wide variety of vendors. 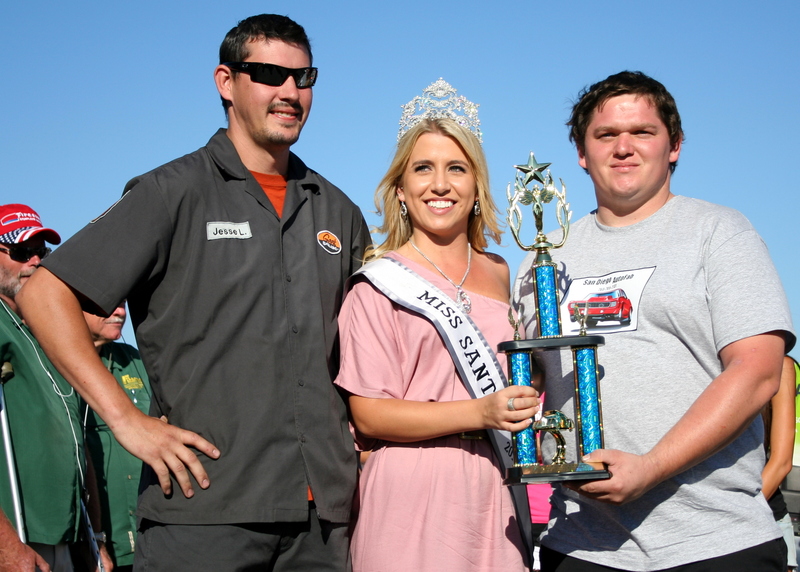 The big winners on the day were the Santee Santas and Santee Food Bank, two community groups that received support and increased awareness through the event. Santee Santas is a non-profit organization that has been providing support to low income seniors and families in the community since 1953. The all-volunteer group works with the Santee School District to identify students and families who need assistance at the holidays and throughout the year. The Family Emergency Fund is available at any time of the year, while the Holiday Food and Toy Program focuses on providing assistance at the holidays. The group also has a Senior Outreach Program that works to make sure that seniors in the community are not forgotten about during the year. Sam Modica, one of the organization’s directors explained that being a part of the Car Show “gives us quite a bit of exposure to the community that we didn’t have in years past.” The group hopes that its attendance at the Car Show and the Santee Street Fair will help bring in both donations and volunteers to help the organization throughout the year. 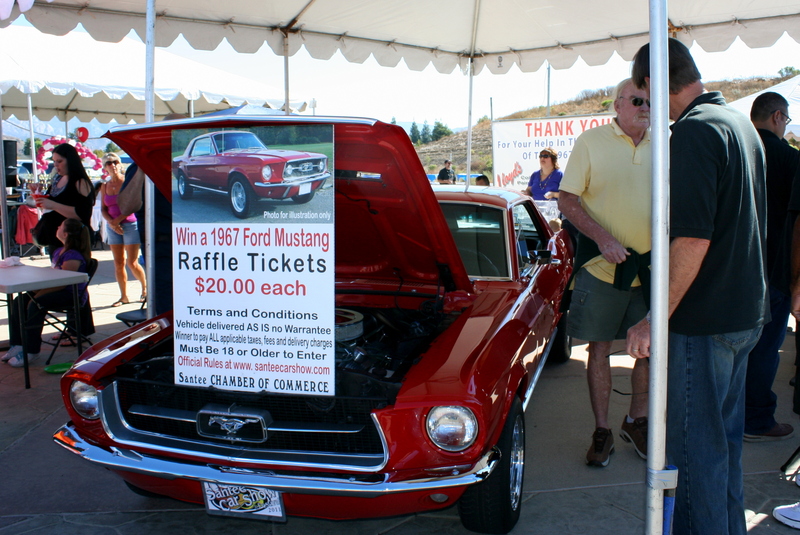 One of the biggest draws for the Car Show was the raffle of a restored 1967 Ford Mustang GT, sponsored by the Santee Chamber of Commerce. Only 2000 tickets were sold at $20 each, with money going to the Santee Santas and the Santee Food Bank. The car was restored by Lloyd’s Collision and Repair of Santee, with help from San Diego Mustang Shop, Mark’s Auto Glass, Mark Luhr’s Custom Upholstery and Xpress Muffler. 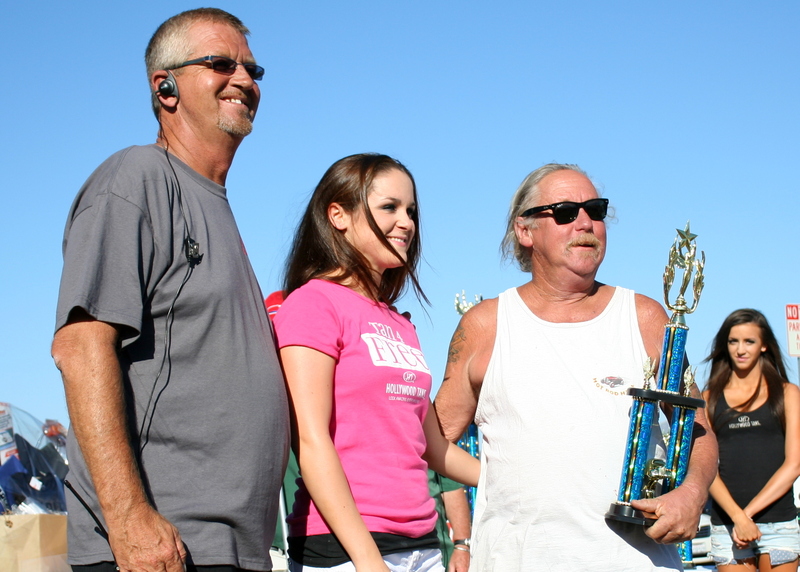 Bob Lloyd, owner of Lloyd’s Collision and a member of the Santee Chamber of Commerce, said that the raffle had been so popular that the Chamber plans to repeat it next year, possibly with a classic Chevy Camaro. After the success of the second Car Show, it’s no surprise that planning is already under way for the third edition, scheduled for early October, 2012. 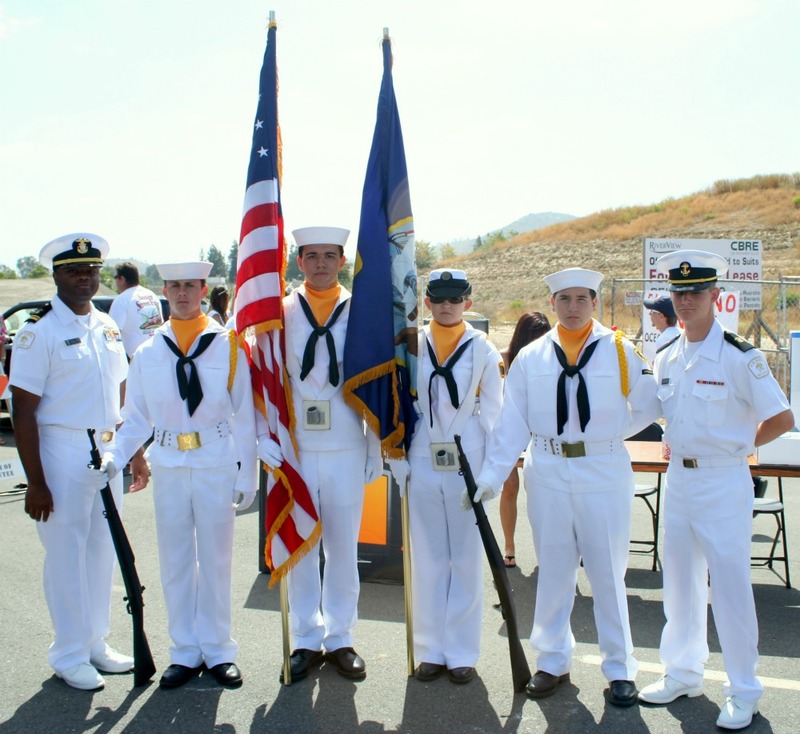 The next major event in Santee will be the Santee Holiday Lighting Celebration in November, followed by the annual Santee Street Fair in May, 2012. 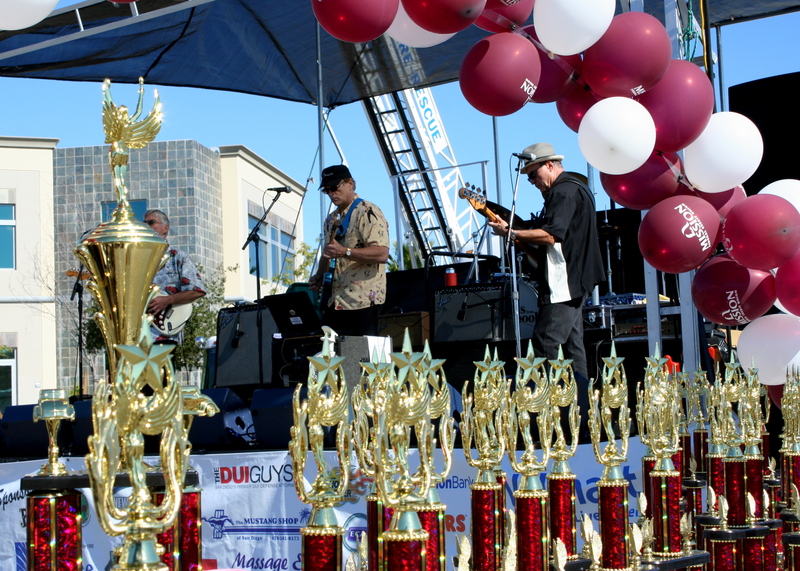 It’s time once again for Santee’s annual Street Fair on Saturday, May 28. This will be the third year for the event, which is put on by the Santee Chamber of Commerce and the City of Santee to help promote the community throughout the greater San Diego County region. 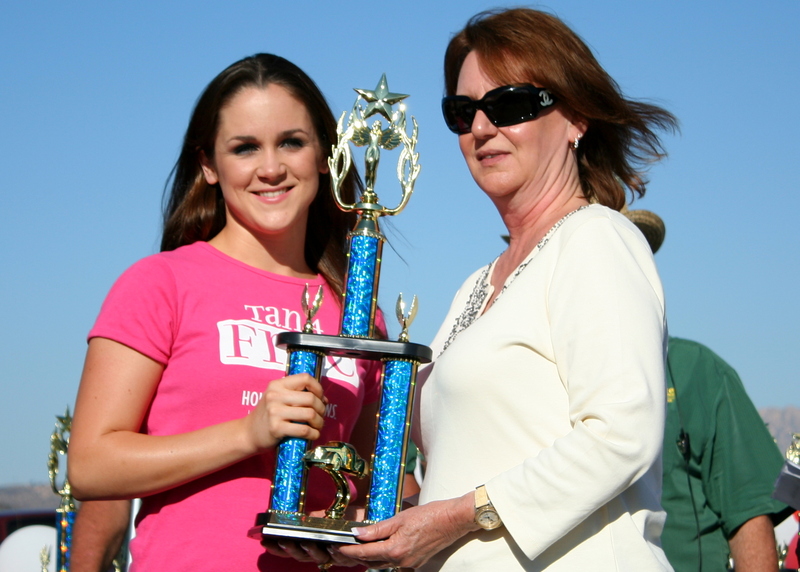 In just two years the Fair has drawn over 100,000 visitors who come to enjoy the food, games, music, and fun. The Street Fair takes place from 10:00 a.m. to 7:00 p.m. along Riverview Parkway, just north of Mission Gorge Rd. You can drive to the Fair, or take the trolley and avoid the parking hassles. There will be some 300 vendor booths, three stages, six bands, community entertainment, and much more. In addition, for the adults, there will be the beer and wine garden presented by Sportsplex USA. This year the musical lineup includes Fossil Fuel, Mudwolf, and Blues 145 at the Trolley Square Amphitheater and the group Country Rockin’ Rebels on the Community Stage. The main stage will feature hot zydeco and Cajun music by Bayou Brothers, Classic rock by the tribute group Credence Relived, and Liquid Blue which has been certified as “The World’s Most Traveled Band” by the Guinness Book of World Records. For directions and more details, visit the Santee Street Fair website. You can check out a promotional video by Sam Diego, aka Captain Sam. 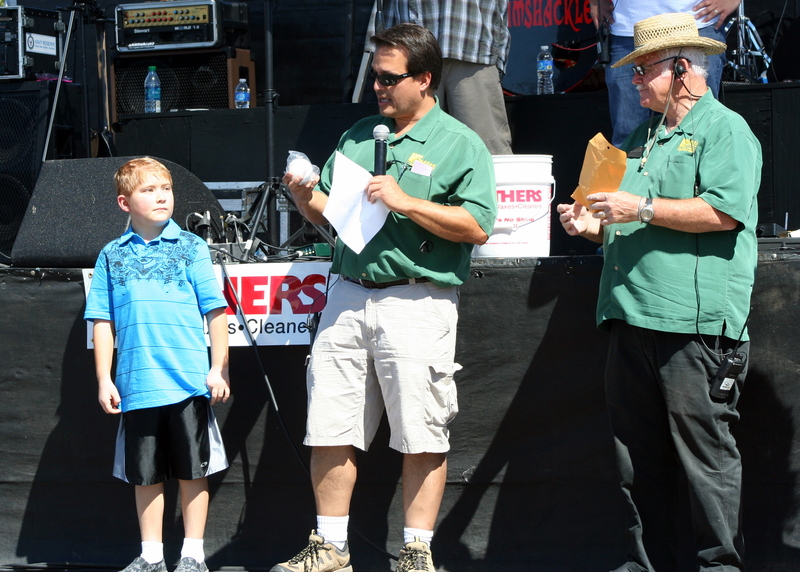 Read about the 2010 Santee Street Fair and the original 2009 Street Fair on Scouting Santee. The Santee Street Fair helps support the Santee Food Bank, so bring a food donation or drop off some of the green when you come. 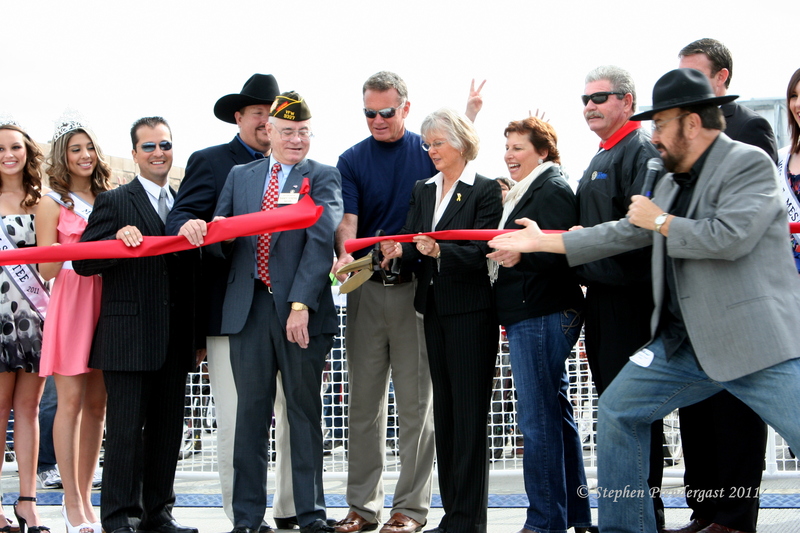 Several thousand people joined local, state, and national representatives to celebrate the completion of the final section of SR-52 through the city of Santee on Saturday, March 19, 2011. The festivities included speeches, a ceremonial ribbon cutting, a flyover by aircraft from the upcoming Gillespie Air Show and a three-mile fun run/walk/bike ride. A classic and green car show, vendor and organization booths and music rounded out the entertainment. Radio personality and former Santee resident “Shotgun” Tom Kelly acted as Master of Ceremonies for the presentation of dignitaries. Current Mayor Randy Voepel introduced the color guard and Pastor Foglio, and Santee Chamber of Commerce Executive Director Warren Savage led the Pledge of Allegiance. Former Mayor and current City Councilman Jack Dale, who was instrumental in pushing for the completion of the freeway, fired up the crowd as he raised his fist and shouted out, “It’s done!” He then went on to talk about the trials of getting the project and introduced other speakers including Congressman Duncan D. Hunter and County Supervisor Diane Jacob. Congressman Hunter drew laughs when he assured the crowd that, unlike a traditional politician, he would not claim responsibility for completing the freeway. He did promise to pass Dale’s thanks along to his father, former Congressman Duncan Hunter, who had been instrumental in securing funding for parts of the freeway project. 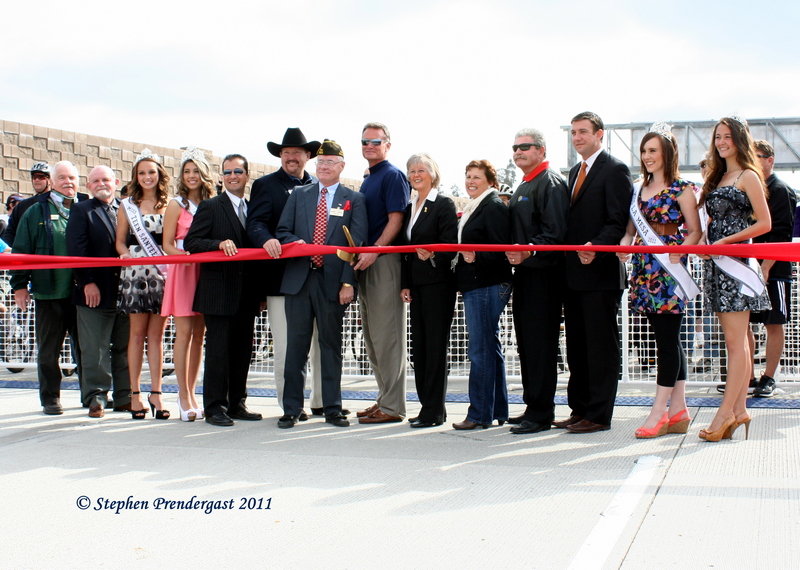 After the speeches the dignitaries, joined by the new Miss Santee and Miss La Mesa Pageant winners, gathered for a ceremonial ribbon cutting on the westbound lanes of the new SR-52. The aircraft made two flyover passes, one before the cutting and one after, and the Santana High School Marching Band performed following the ceremony. Once the road had been cleared several hundred bicycle riders of all ages started off on their fun ride, followed by the runners and walkers. It was nearly impossible to get an accurate count of all the participants as more arrived after the official beginning. Once they had completed the three-mile route, participants were routed across to the eastbound lanes where the car show and vendor booths were set up. In addition, the local Country band Emerald River performed on the stage after the ceremony. State Route 52 (SR-52) is a 17.7 mile freeway that stretches from La Jolla on the coast to SR-67 on the east side of Santee. The project was built in multiple stages, reaching the outskirts of Santee and connecting to SR-125 before hitting a 17-year delay. Construction on the final 3.5 mile portion began in 2008 and final touches will be applied over the next week in preparation for its scheduled opening to use on March 26. 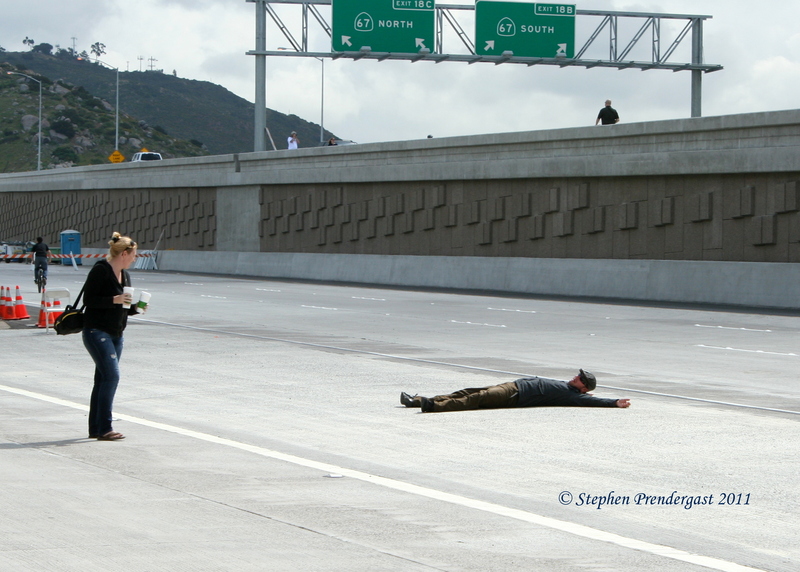 After that time it will no longer be legal or safe to lie down on the freeway. 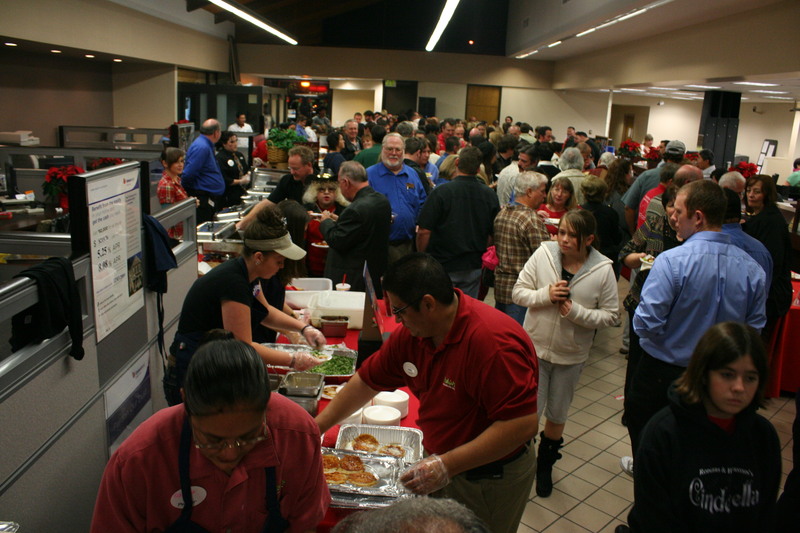 Santee’s annual extravaganza of food returns on Thursday, December 2, at the Union Bank in the CVS/Best Buy Center. The Taste of Santee is an annual event that combines the Santee Chamber of Commerce’s December Mixer with a fund raiser for Santee Santas and a showcase for local restaurants and caterers. The night is one of the major sources of funds and resources for the Santee Santas, which has provided assistance to Santee families for over 50 years. As always, admission is either $5, an unwrapped toy, or non-perishable food – but all three are more than welcome. Last year’s lineup included Chili’s, Coffee Brake, Don Lucio’s Taco Shop, Eccentric International Chefs, Michael’s Grill, and many more. You can always expect a great selection of food at the Taste of Santee. You can check out the fun at the last two Taste of Santee nights below. Following up on the success of the two-year-old Santee Street Fair, the Santee Chamber of Commerce pulled off the first Santee Car Show on Saturday, October 9. The day saw an estimated 10,000 visitors enjoying over 175 classic cars, trucks, motorcycles, and off-road vehicles, a wine and beer garden, and music by local band Ramshackle and San Diego favorite The Corvettes. Adding to the fun were dozens of local businesses and food establishments, and a generous sprinkling of political candidates. 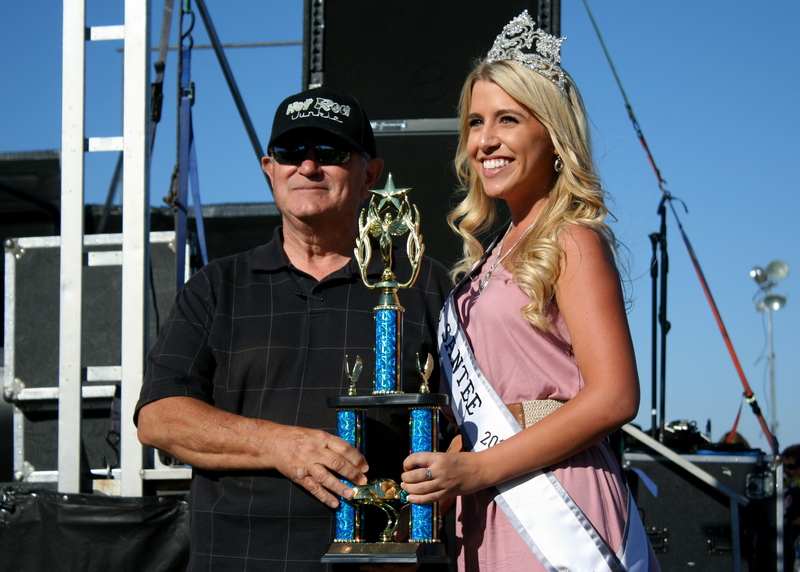 The Car Show was a way to both showcase Santee and its businesses and to support two special organizations: Santee Santas and the Santee Food Bank. 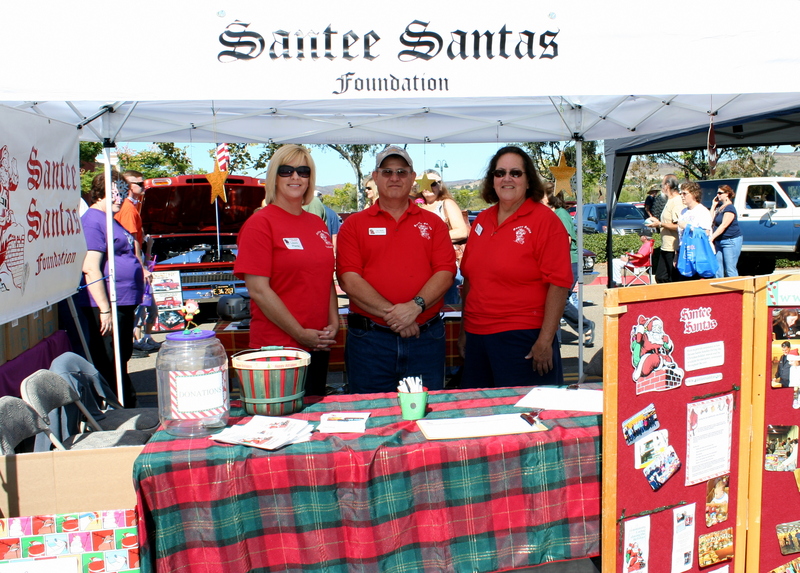 Santee Santas is a community support group that provides food and toys to needy Santee families at the holidays. They also have an emergency fund program and a senior outreach program for seniors who are alone or in nursing homes. The Santee Food Bank provides non-perishable food for needy families in the community. Both of these groups benefitted greatly from the exposure as well as from donations and money raised through a silent auction and other activities. The day also became an opportunity for the community to come together for one more special cause – a young Santee boy named Ryan who was recently diagnosed with a malignant brain tumor. Ryan was diagnosed on August 13 and has already had two surgeries on the tumor, but you would not have known by looking at him. He was bright, spunky, and not too overwhelmed with all the attention he was getting. Santana National Little League had a booth taking donations toward his medical bills, and his family, which already has a disabled 5-year-old child, will hold a fundraiser at Jimano’s Pizza on Thursday, October 21 from 7:00-9:00 pm. At the Show, Ryan received a baseball autographed by former Padre and Hall of Famer Ozzie Smith from the Chamber, and Ramshackle gave him a set of drumsticks from their set. You can follow up with Ryan and his family on Facebook and at CaringBridge.org. This being election time, the politicians were popping up like mushrooms after a heavy rain – not that we know much about heavy rains in Santee. Candidates for local, state, and national offices were there in person or through their local supporters to meet the public and answer questions. 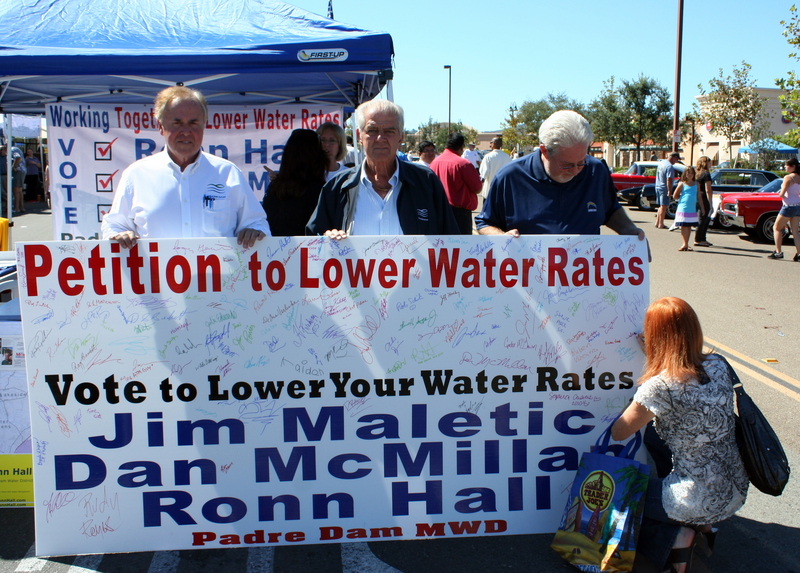 At least 5 of the 8 candidates for City Council put in appearances, as did many of those running for Padre Dam Water District Board and local school boards. Watch for some interviews with candidates over the next few weeks. As with the Street Fair, music was a big part of the day. 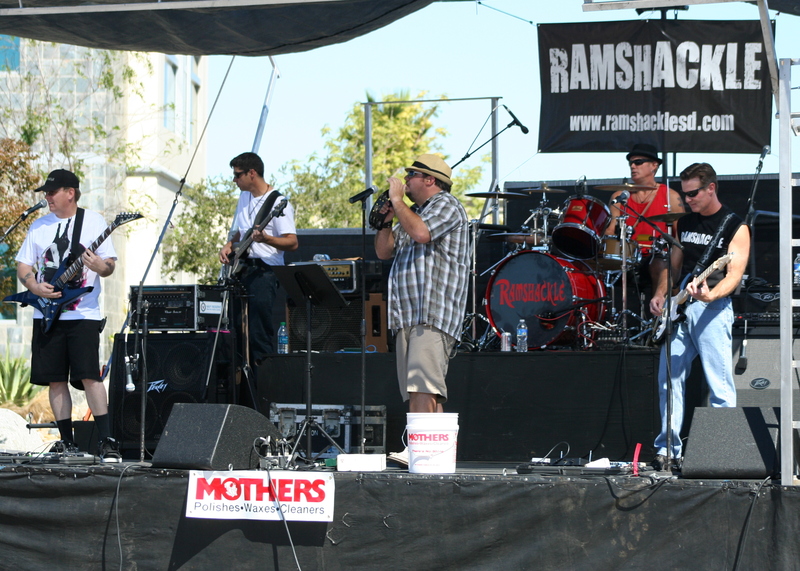 Local band Ramshackle, featuring lead vocalist Eddie Vandiver, entertained the crowd with a mix of music by artists as varied as Tommy Tutone, Johnny Cash, Tom Petty, and Bachman-Turner Overdrive. Ramshackle was followed on stage by, fittingly for a car show, The Corvettes. One of the top oldies bands in San Diego, The Corvettes include keyboardist Sam Witkin, an original member of Sha-Na-Na and veteran of Woodstock. Of course the big draw of the day was the collection of amazing vehicles at the show. From wonderfully restored classic cars to amazingly detailed and decorated modern cars, there was a vehicle to satisfy just about everyone. 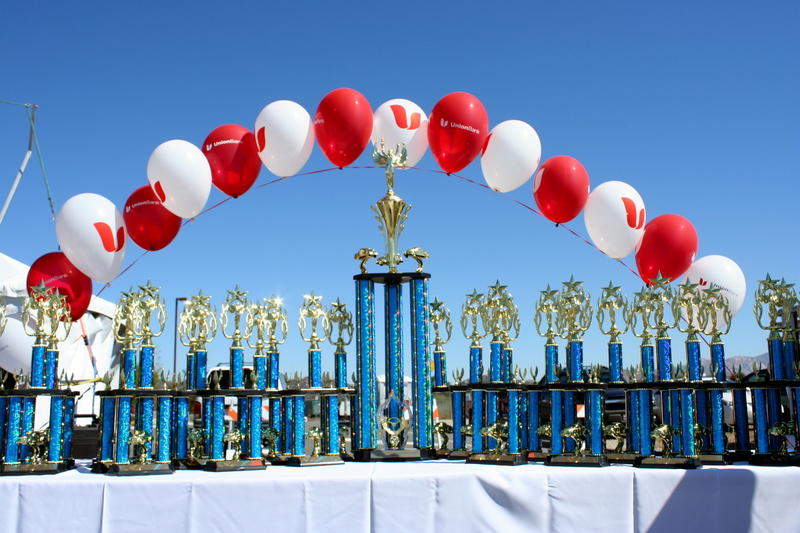 The Show and its sponsors provided a number of trophies for the top cars, including Sponsor Trophies, People’s Choice, and the Best of Show Trophy. In addition, a plaque was presented to the club that brought the most cars to the show. 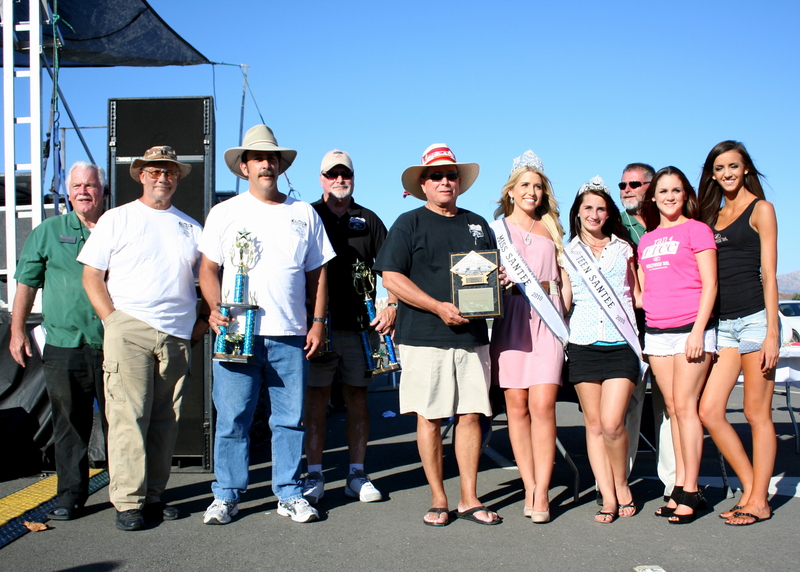 For the first year that award went to the Poway Cruisers for bringing 10 cars. Other top winners are below. Apologies for any misspelled names. *The Lloyd’s Collision and Best Buy Trophies were accepted by designates of the winners. Sadly, shortly after the car show my hard drive crashed before I had the chance to back up my photos. The link above is to a few I put online just before the crash. How do you follow up a wildly successful street fair? 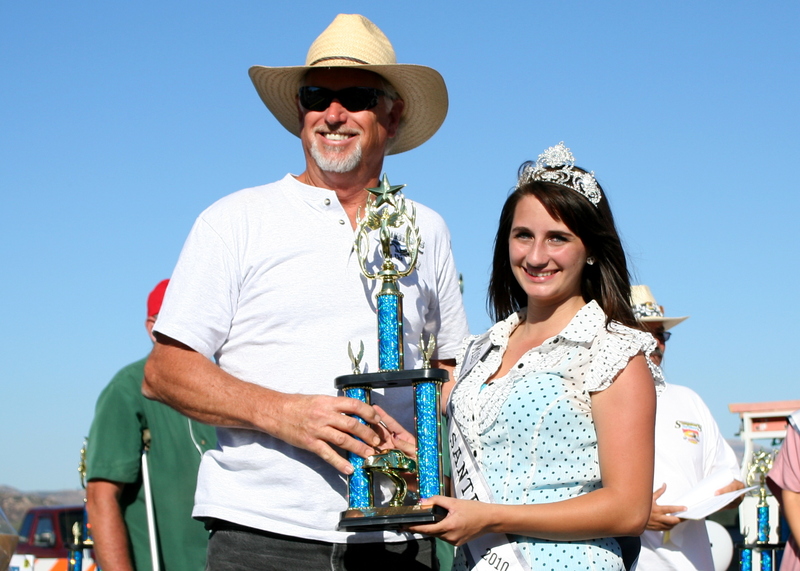 If you’re Santee you put together what promises to be an equally successful car show. The first annual Santee Car Show will take place on Saturday, October 9, along Riverview Parkway, the same site as the Santee Street Fair. The show will feature over 200 classic cars, trucks, and motorcycles, vendors, food booths, music, and a wine and beer garden. The fun starts at 9:00 am and continues until 5:00 pm and admission is free. The Santee Chamber of Commerce has worked hard to bring together a great lineup for the day. Local band Ramshackle will lead off the musical entertainment, followed by headliners The Corvettes. As an added treat, the Fabulous World-Famous Corvette Diner Dancers will be on hand to perform some of their own creative routines. The Car Show will also feature special guest MC Clint August of 101KGB’s “BC and Clint” afternoon drive-time show. 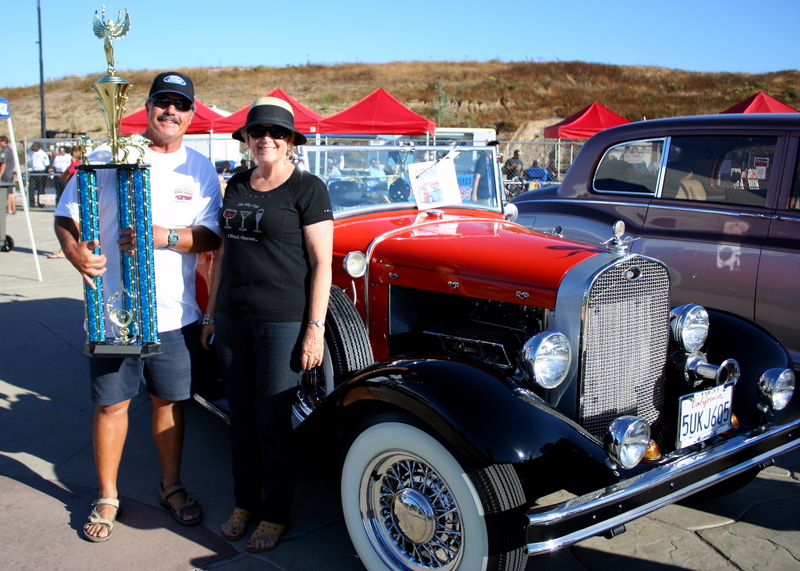 Along with a showcase for cool cars and great businesses, the Car Show is a fundraiser for two important organizations: Santee Santas and the Santee Food Bank. 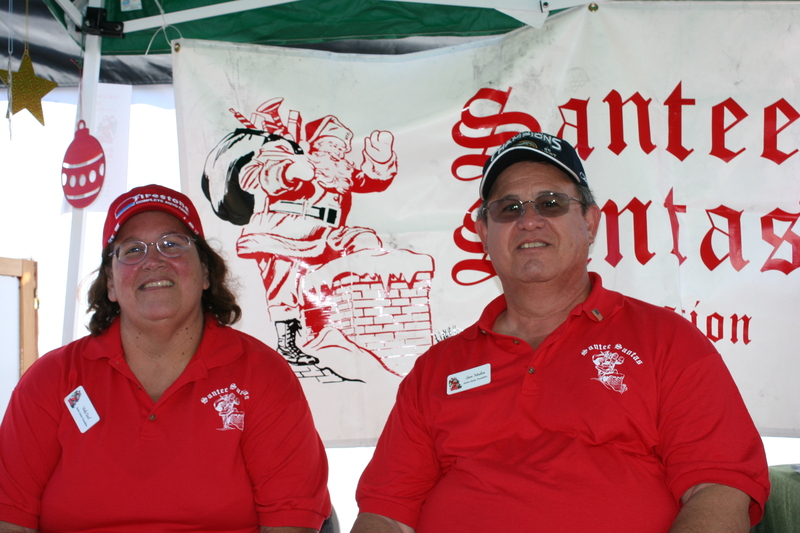 Santee Santas is a community support group that provides food and toys to needy Santee families at the holidays. They also have an emergency fund program and a senior outreach program for seniors who are alone or in nursing homes. 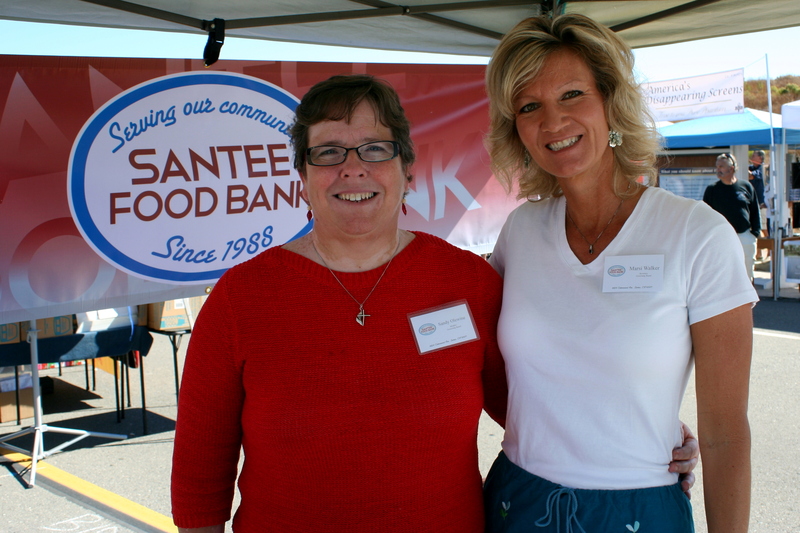 The Santee Food Bank provides non-perishable food for needy families in the community. Representatives of both groups will be accepting donations of food and money during the event. 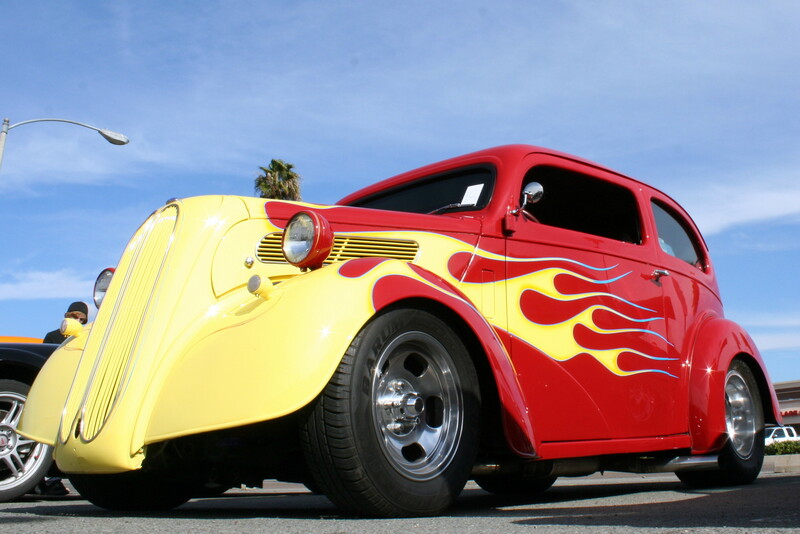 If you enjoy hot cars, cool music, and fun, be sure to check out the Santee Car Show this Saturday. For more information, check out the Santee Car Show website.